The single largest roadblock that prevents most people from picking up a PlayStation 3 is the price. Sony's just taken that roadblock and shrunk it. You're now $100 more likely to buy a PlayStation 3. The PlayStation 3 Slim is actually more similar to the current PlayStation 3 fat than you'd think. Sony has been slowly phasing out features in the PS3 for a while, dumping USB ports, dumping card readers and dumping the PlayStation 2 backward compatibility. So the step to a Slim, now, isn't actually that steep, compared to what you'd get if you switched from a launch PS3. What you do get with the Slim is a smaller size, a reduced power consumption rate and a lower price. The lower power usage partially comes from the 45nm manufacturing process, and provides a 34% decrease in power consumption. (It's also 32% smaller and 36% lighter). And, the Slim adds the ability to bitstream Dolby TrueHD and DTS-HD audio, which only matters if you're an audiophile with a modern sound system. You also get a new matte finish, which makes the console look less "premium", but eliminates the crazy fingerprint and dust problem the original had. Overall, it's a net gain in goodness. So, The PS3 Slim Can Bitstream Dolby TrueHD and DTS-HD Master Audio After All? Because it's basically the same console, the only differences you're going to notice are audible ones. Like we said in our hands on, the disc drive in the PS3 Slim is louder than in the original PlayStation 3. Think of it like a laptop optical disc drive vs. a desktop optical disc drive. When you're seeking around, it makes a louder grinding noise than its larger counterpart. This noise makes no difference in Blu-ray movie watching, since it's all sequential, and is only occasionally encountered in games, especially since many game install bits and pieces to the hard drive. Other than that, yeah, it plays the same PS3 games, and it watches the same Blu-ray movies. 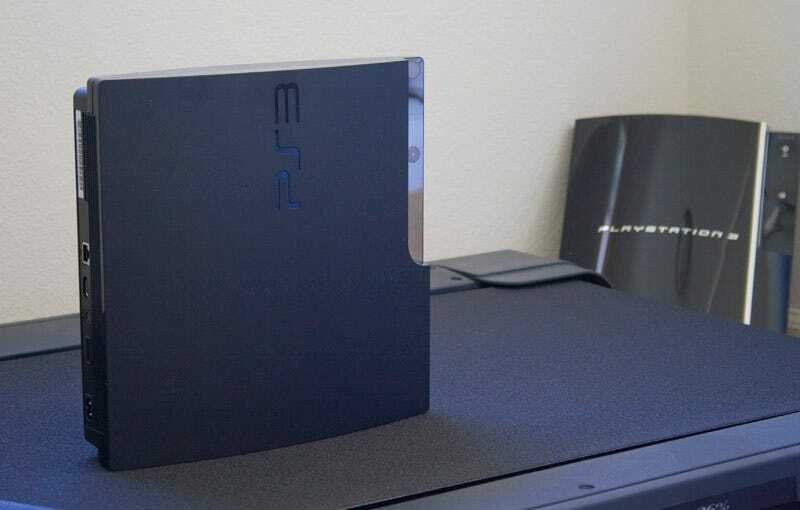 Think about the PlayStation 3 and the PlayStation 3 Slim like this. You have two wives (I don't know, imagine you're Bill Paxton). Ninety-five percent of the time, they both do pretty much the same things. One is slightly chubbier, the other is slightly svelter. The skinnier one is quieter most of the time, but can get yappy when she can't find something. The thinner one also costs you a little less money, and...has a matted finish? This metaphor isn't going anywhere good, but you get the point. They're basically the same console, except now it's thinner and cheaper. So the only question now is whether or not you should buy a PlayStation 3 now, or wait until September for the PS3 Slim. Both options are $300, but if you want the ability to install Linux, you'll have to get the PlayStation 3 fat. Then again, the three of you who want that probably already have a PS3.